Just when you have a schedule locked down for your toddler, one of their naps starts becoming shorter and your little one throws a monkey wrench in your plans. Your carefully crafted timetable is about to shift again as your child gets ready to transition down to one nap. This usually occurs when your toddler is around 15– 18 months of age, but can occur earlier. Despite having to change your daily pattern, I think you’ll enjoy having that one long nap in the middle of the day. If you don’t have siblings to entertain, you’ll find that you can get a lot more done in those 2-3 hours. Or… you could spend that time relaxing and just being you for a little while. 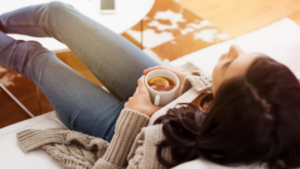 The transition to one nap also provides more flexibility in the morning and afternoon for extended outings. You aren’t as tied to staying close to home in order to get back for naptime. You will suddenly have the whole morning to go out and do whatever is needed. I personally loved the transition to one nap, granted that was after all the kinks were worked out. It was a lot more freeing and I had time to invest in myself. They just can’t fall asleep for that second nap. If your toddler starts fussing longer and longer before falling asleep, this is a strong indicator that they are ready for one nap. You might notice this behavior a couple days in a row and then the third day, they sack out instantaneously. This is quite common. However, if your little one is fighting that second nap, 4-5 times per week, it is time to make the transition. 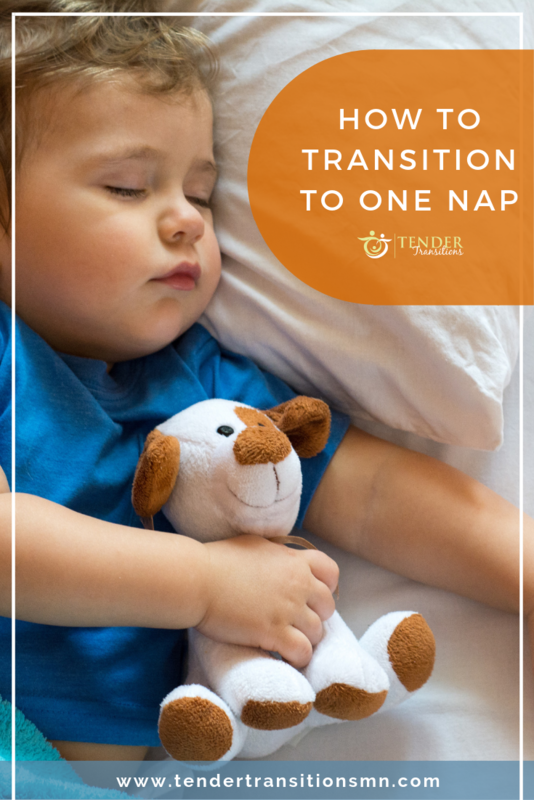 If you notice that your toddler’s naps are getting shorter than normal, it may be time to transition. You will observe that one of their naps regularly becomes shorter and shorter. It is often the afternoon nap that is affected first. So, for the last two weeks, your little one has been regularly showing signs that they are ready, now how do you actually implement this change in schedule? Once you make the change, don’t back-step. It will just cause more confusion and will complicate the transition even more. 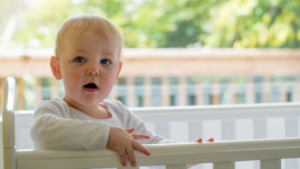 Your toddler may need to gradually extend their wake time between waking up and naptime. I suggest nudging naptime back by 30 min every 3-5 days until you reach the desired naptime, which is usually around 12:00-12: 30pm. If you move the time back too quickly, you might be met with resistance or an overtired child, which is actually harder to put down for naptime. Avoid Soothing Activities Around Previous Naptimes. Avoid going for a car ride or taking your toddler out for a walk in the stroller around their old naptime. 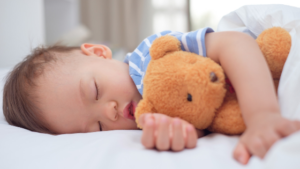 They will likely still get a bit sleepy around this time, so a piece of fruit or a new activity can provide just enough of a perk to keep your little one awake until the later naptime. For most families, this transition takes a bit of time. Others find that it’s easy to just move the naptime back. Hopefully, this is the case for you! You may find that you have to temporarily make their bedtime a bit earlier in order to bridge the gap from nap to bedtime. Initially, there will be inconsistency in the length of their nap. This is completely normal and to be expected while their bodies learn to consolidate the amount of daytime sleep they require into one afternoon nap. 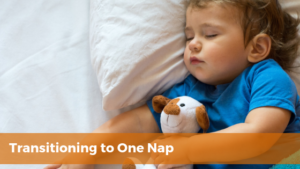 And just like that, before you know it, your little one will have transitioned to one nap per day. You will love the longer break and more flexible schedule. If you have any questions about changing sleep schedules or if your little one is struggling with napping, please schedule a time to chat. We would love to help you.